Check Health of Hard Disk: Today we are going to show you how to check the health of your hard drive. These discs are where we keep all the information on our computer. So it is important to monitor your hard disk status from time to time to avoid that it could be damaged at the least opportune moment. Especially if they are discs that already have a few years behind them. As they were old and we don’t know when it is gonna go down. So we always recommend you to check the health of hard disk before storing any important documents. It is must and should to be safe with important files. 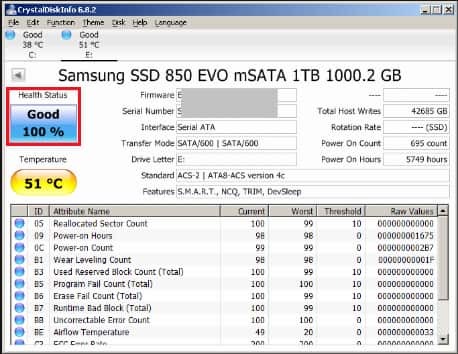 We will use one of the best tools to perform hard disk analysis. Specifically, we will use the CrystalDiskInfo application because it is open source and which makes it safer, easier to use. Its interface is user friendly and great to use. Easy to understand and very easy to start using it. But before you start you have to download the application. For that, go to this website and click on the Download button of the CrystalDiskInfo section that you have at the beginning. or Just Click the below link. You will go to a page where several versions of the program appear. Go to where CrystalDiskInfo 7.5.0 and in the Standard Edition press the exe link. So that the application is downloaded in an executable .exe file that is easy to install. You will go to another page where the download will start and you will only need to install it as you do with any other application. Using this application has no great mystery. When you run it, it will ask for the administrator’s permission. Grant permission. After Granting them, the program will analyze your hard disks when it starts. In the main screen, top left will have a blue box where it says health status and if the hard drive is Good. 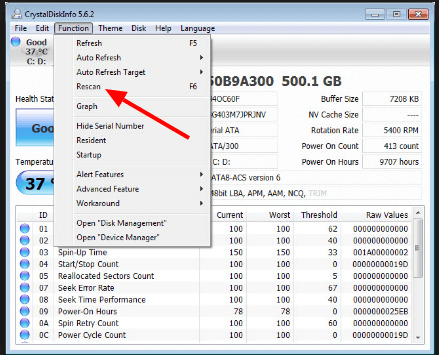 If you have more than one hard disk, at the top of the application you can click on the disks that you have on the PC. Each time you do all the information will change to show you the selected disk. And it is that next to the temperature you will see all the data of the disc, from its name, capacity and serial number. Selected letter or the time during which you have been using it. If one of the hard disks is not one hundred percent in State of health you can see the percentage of your health. For example, in the below picture under Good, I get 90%. Below all you have a list of data about the health of the disk and in the picture, you can see that it puts Percent Lifetime Used at 90%. That means that I have already spent 10% of the life of that disk. The different problems that the disk may have will appear in this list. If you want to re-scan the health of your hard drive. Click on the Function option in the top menu and in the drop-down menu choose the Rescan option. Just do not expect big changes except maybe the temperature. The health percentage of the hard drive is vital. Since the lower it is the less it will be for your hard drive to die. Therefore, be aware of these indicators and when you see that the health of one of your discs suffers, start thinking about making backup copies and/or buying another to replace it. Hence, This is how the process of checking the health of a hard disk or hard drive is done. We have explained everything step by step and in an easy manner. We hope you like this article and support us by sharing it on your social media accounts. Feel free to ask your questions and also your experience after performing the steps. Stay Tuned to Cracko for more awesome articles on technology.